Bailey Willey throws a pitch during Indian River’s 10-0 mercy-rule win over First State Military Academy on Tuesday, May 22. The seniors and their families line up for a photo 3during Tuesday’s Senior Night event. 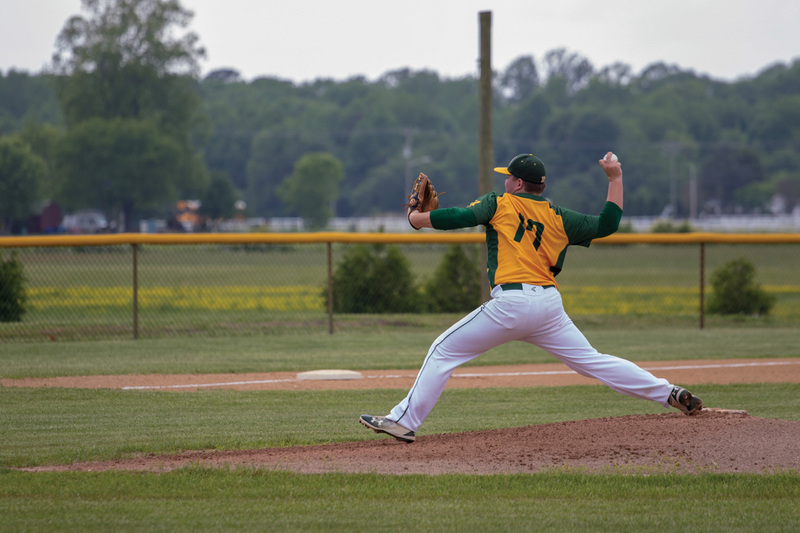 There was a point a few weeks back when Indian River High School baseball skipper Derek “D.J.” Long was not happy with his team’s attitude, approach and interest level in a game against Delmarva Christian High School. However, a team meeting after that game must have done wonders, because since that time the Indians have rattled off six wins of seven games, including Tuesday’s 10-0 mercy-rule win over First State Military Academy. 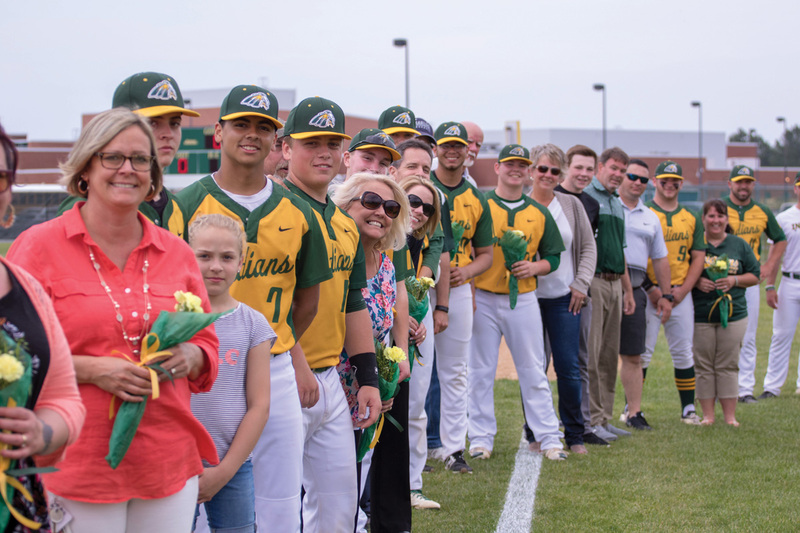 Seven Indians seniors were recognized prior to the game, and it was some of those seniors who helped deliver the victory in their final regular-season game before the DIAA state playoffs. Pitcher Bailey Willey pitched a complete game, needing just 57 pitches over five innings for the shutout win. The righty allowed just two first-inning hits, while striking out four and walking two. The Indians banged out 10 hits, led by senior Cole Hitch’s 3-for-3 day, while also knocking in two runs, and scoring another. J.J. Killen was 2-for-3 with a double, three RBIs and two runs scored. Senior Mark Smith scored a three runs for IR with his 1-for-1 plate showing. In all, seven different Indians collected hits on the day. Jacob Anderson’s lone hit was a double, and senior Brock Wingate was 1-for-1 with a triple and run scored. Grant Argo also knocked in a run for IR. And he was more than happy with the effort he got on the bump from Willey. The seven seniors for IR baseball this year were Willey, Hitch, Smith, Wingate, Myles Clark, Alex Pszczola and manager Andrew White. IR scored four in the first inning, thanks to Hitch’s two-run double, a passed ball and Argo’s RBI single. They would add two more in the second on Killen’s run-scoring single and another passed ball. Two more passed balls in the third inning scored a pair. The game was brought to an end thanks to a two-run double to center by Killen. The Indians picked up the No. 16 seed in the DIAA state playoffs and were set to open up against 17-seed Dover on Thursday, May 24, after Coastal Point press time. For results and highlights from the game, be sure to check out the Coastal Point sports Facebook and Twitter pages.